Skil-Care Mobile Arm Support is a shoulder-elbow-wrist-hand orthosis, providing stable arm and lateral body support. This wheelchair arm support has an adjustable-angle that permits you to adapt it to the specific needs of your patient. This arm bolster is easy to install to any full-arm or desk-arm wheelchair. Select between a level-arm model or an elevated-arm model. The evaluated option provides full-hand extension for edema control. An attached arm trough is removable and constructed of high-density foam for comfort. 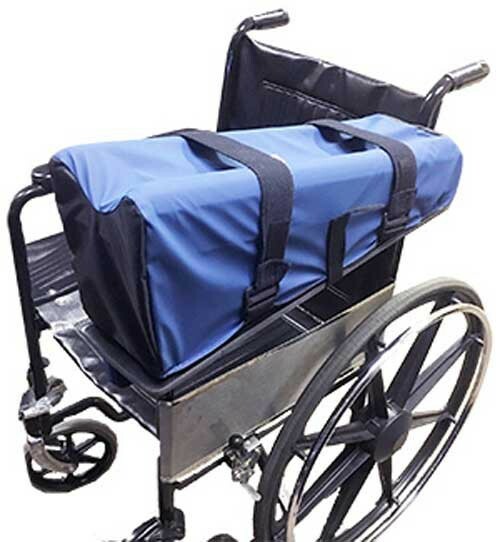 The wheelchair arm bolster is covered with Low-Shear II fabric that reduces friction to the skin. It is easy to clean with a spray and wipe cleanser. Lint and other particles may accumulate in the Velcro fasteners. These strap fasteners may be removed by brushing the fasteners with a small, stiff brush. Mounts to most standard wheelchairs. Helps patients with contracted arms. Adjustable angle adapts to individual patient needs. Low-Shear II cover reduces friction and skin damage. Product Numbers: 706215, 706220, 706225. Style: Left arm or right arm. Skil-Care Mobile Arm Bolster provides user information and care instructions for this wheelchair support device.